Why is a very rare steak called 'blue'? What's blue in the picture above? It's called “blue” because it has a blueish color. Beef meat has a blueish (or purplish, depending on your color perception) color, changing to red with exposure to air as oxygenated myoglobin becomes the dominant factor in the color and to brown with heat. The initial “blue” isn't a very strong blue, it's more blue as in not the bright red that the meat becomes when it starts cooking. White meat has less myoglobin and more albumin. Mere exposure to air without any heating is enough to oxygenate myoglobin well before the meat spoils, so “blue” isn't really applicable to a cut of meat by the time you buy it from a butcher's. So, it seems it may be simply based on colour, and blue and purple are not a million miles different. Hot crusty sear (black) on the outside, cold (blue) on the inside, this steak "doneness" results from cooking over intense heat for a brief period. When and where did this method of cooking steak occur? 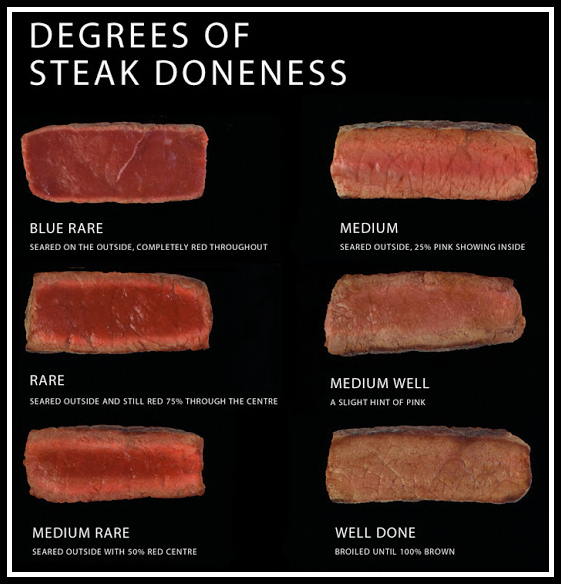 James Beard's notes on steak "doneness" [1954, 1961] do not reference "black and blue." Chef Paul Proudhomme's "blackened" craze circa mid-1980s may have gently mentored the "black and blue" steak. The difference, of course, is that Proudhomme's "blackened" resulted from fiery flavors in addition to cooking methods. While print evidence confirms the phrase was used in mid-1970s USA, the actual practice became popular twenty years later. Some folks call this Pittsburgh-style steak. Why do we talk a blue streak? Origin of “blue” for rude? What is “Pop art blue”? What's the meaning of “ a blue berserk”? Can blue also have a positive connotation? What's the etymology of “Blue dollar”?